The prologue episode to the new iDOLM@STER TV anime, Side-M, aired what was overnight by UK time. I’m not really a big enough Side-M fan to have anything particularly insightful to say about it, but Episode of Jupiter was good enough to be pretty reassuring about the series going forward. It’s probably an inevitability given what Jupiter are and how they came to exist within the iDOLM@STER universe, but Episode of Jupiter does lean far more into the 765Pro anime series far more than I’d necessarily expect the rest of the series to, and certainly more than Cinderella Girls did. I mean, Cinderella Girls certainly existed, theoretically, in the same anime universe as the 765Pro show – it has its callbacks here and there – but Episode of Jupiter explicitly follows on the from end of the 765Pro show, and concurrently with the movie. I mean, they actually reprise a scene from the movie within the show. I understand them redrawing Jupiter based on current style-guides, but it was funny to see Haruka redrawn from the same scene in the movie just to have her eyebrows drawn ontop of her bangs. Also, the contents of one of the vending machines was altered. But, again, it’s to be expected due to the nature of what Jupiter are – they were explicitly introduced to be the players rival characters in the iM@S2 game, a role they shared in the TV anime, and were being needlessly antagonistic due to having naively believed Kuroi’s lies about the way 765Pro operates. Regardless of your prologue poison, the point is generally that they ultimately see Kuroi for what he is and end up going it alone in a far more honest fashion. 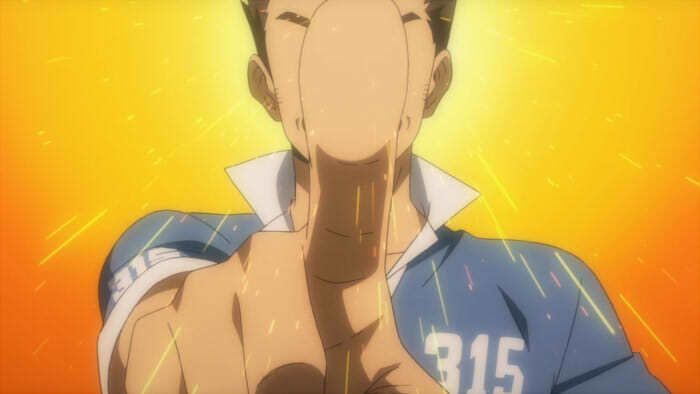 The repeated lengths they went to do hide Saitou’s face was the best gag. The interesting thing about the show, I guess, is that it exists in a slightly different space to most of the other idol shows. The 765Pro Show follows a small company with a bunch of established but unpopular idols. Cinderella Girls is similar to a degree but within the political environment of far larger company. 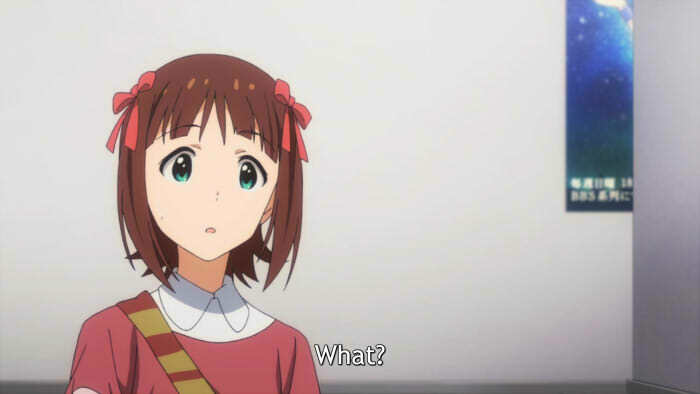 Wake Up Girls is the extreme of a no-name company with no business producing idols producing a group of mostly no-names. Love Live is the absolute extreme of being set in a universe where the actual realities of what idols and the industry around it are don’t even exist, where idol merchandising is something that seems to be entirely fan-produced to the point where it doesn’t weird out the girls that they are seeing products with high-quality gravure shots of themselves on them being sold that they were entirely unaware of. 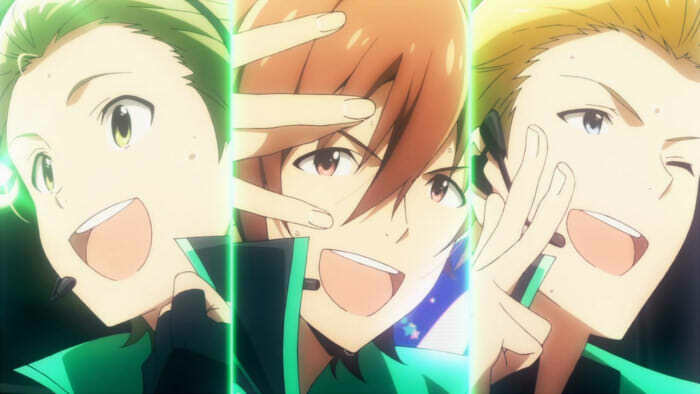 Episode of Jupiter, on the other hand, is about an idol group who used to be famous trying to regain their footing again. This is interesting in it’s own right, but it does play into what’s a larger theme throughout much of Side-M as a property – there’s an awful lot of characters who used to be something else. 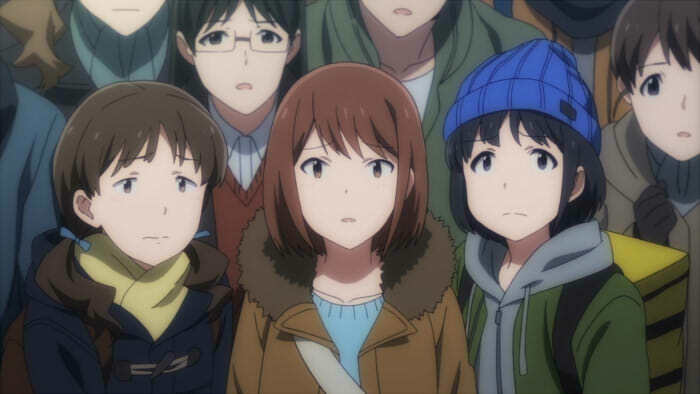 The end of the episode introduces frequent Side-M poster characters Dramatic Stars, who between them used to be a Pilot, a Doctor and a Lawyer. Other units within the Side-M universe include former teachers looking to promote their specialist subjects, former emergency services members, former performers from other fields of entertainment and, well, a former Dearly Star. As unfortunate as it feels to be the thing to point out, it’s the unique thing they can get away with by virtue of the fact that you can get away with having older characters in a Male idol show than you can with the Female-led shows – having a 28 year old character in a show like Side-M is not something someone is going to bat an eye-lid at. Having a 28 year old character in a female idol show is having an Experienced Producer or secretary. That, I have to admit, is the kind of thing I hope the show ends up at least trying to lean into somewhat. Most of these characters have at least some experience elsewhere in society that a lot of the characters in your 765Pros or your Love Lives or your WUGs don’t have. It’s a unique perspective that can be explored, should they wish to. That said, even if they don’t, Episode of Jupiter was handled well enough that I do at least feel relatively confident that they’re going to do something interesting with the show. Also, all of Jupiters fans were really cute. Especially the guys. Don’t tell me that Saitou isn’t the most moe.